Haha oh wow Sony is terrible so far. Ghost Recon actually looked sort of neat at Ubisoft, though. When Kaz mentioned that the Vita would use AT&T, the audience started laughing. Oh my god, it was hilarious. EDIT: Oh ****. Tretton make a quick reference to the Ridge Racer thing, to get back at Kaz who made fun of his tie. If I attempted to agree with you anymore I would pop a blood vessel in one of my eyes, ill be glad to see this 3D stuff pass, if it don't and I have to buy a 2000$ 3D TV to keep gaming then Ill just find another hobby. Sony's conference can be summed up in one word - Boring. The sad thing is that it's probably still better then Microsoft's (mostly because on the kinect crap) Sony could have cut a lot of stuff down. Vita has Party chat but not the PS3? 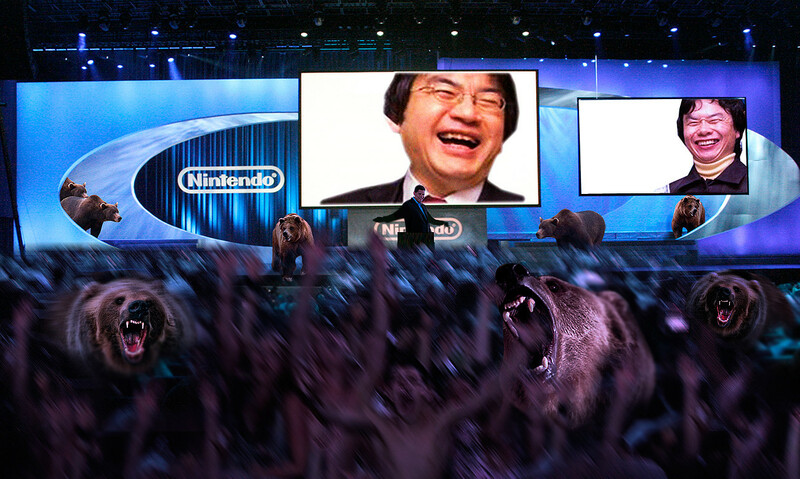 Wow Nintendo doesn't need to do much to "win" E3, and they are showing new hardware to begin with. Damn I'm calling it now. Nintendo trolling people I assume? I'm looking forward to the show, and I don't even really care much for Nintendo.